Consolidate data from multiple Excel files into one without opening each of them. Sum, count, find the maximum, minimum, or average value in three simple steps. 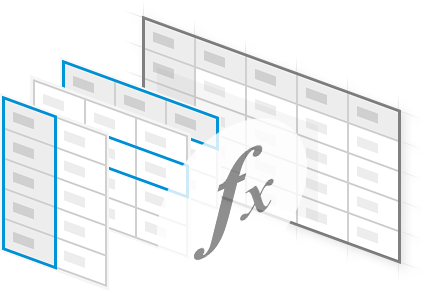 The Consolidate Sheets tool can summarize your data by column headers, row headers, or position in a table. 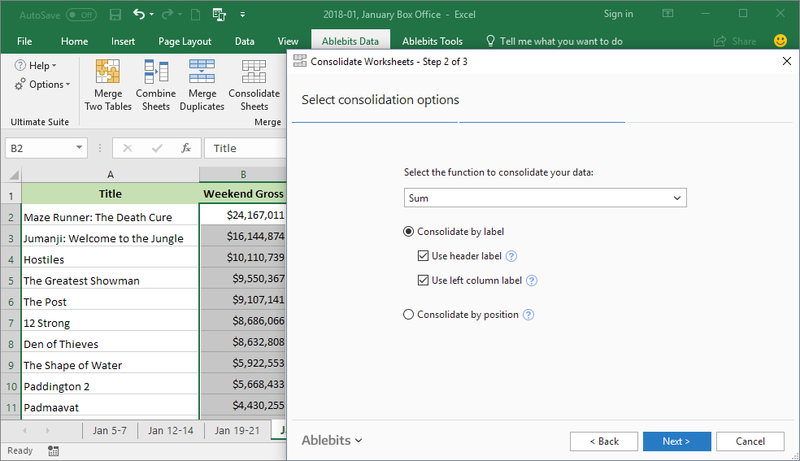 Consolidate multiple Excel files at once You can select as many Excel workbooks for merging as you need without even opening them. Summarize any range Have the add-in consolidate all data on the sheet or select the desired range. 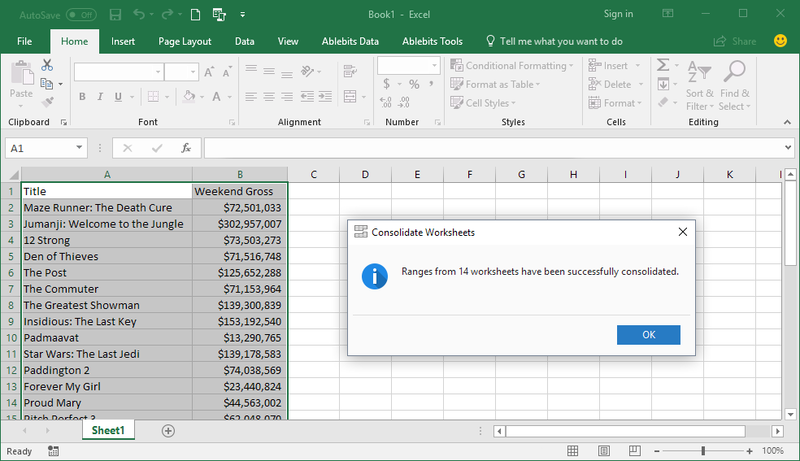 Summarize your data in 11 different ways All Excel consolidate functions are at your disposal to calculate the numbers one way or another. Consolidate data in columns and rows Use column and row labels separately or together to calculate the numbers at the intersection. Consolidate by position Have numbers merged and calculated according to their position in your tables. Define a place for results Get the result in a new workbook, new worksheet, or any destination range that you specify. What is Consolidate Sheets and what do I need it for? 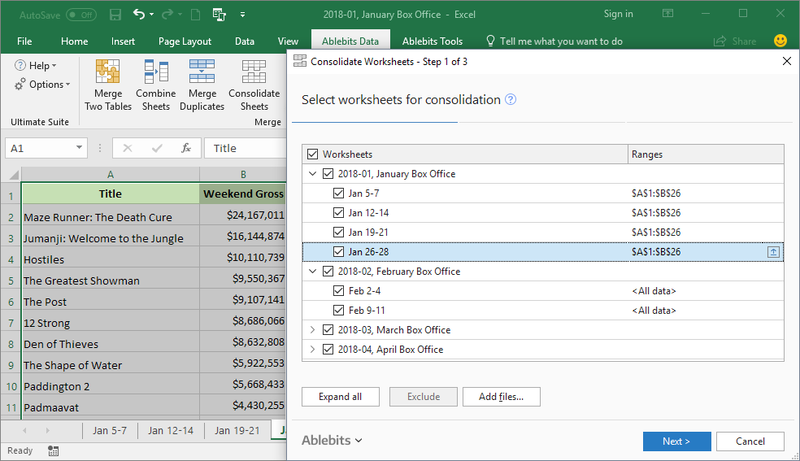 The Consolidate Sheets tool not only joins multiple Excel sheets together. It creates a full summary of your numbers, using any of Excel consolidate functions such as Sum, Count, Average, Min, Max, etc. Doesn't Excel provide a way to consolidate data? It does. 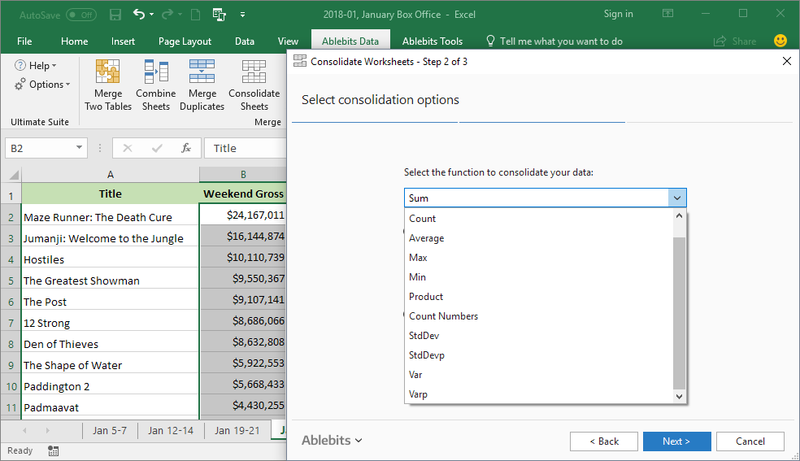 You can use the built-in Excel Consolidate feature. But our Consolidate Sheets offers a user-friendly and intuitive way to join worksheets together. It will walk you through the consolidation process helping you configure all the options. In addition, our add-in can summarize data not only by column or row labels, but also by position. How to consolidate many Excel files at once? Choose to consolidate by label or by position. How many Excel worksheets can I consolidate at once? You are free to merge and calculate as many files as you need as long as the result table doesn't exceed the limit for cells in your Excel version. What functions does Consolidate Sheets summarize with? Our utility uses the following Excel consolidate functions: Sum, Count, Average, Max, Min, Product, Count Numbers, Stddev, Stddevp, Var, Varp.